Noam Chomsky says that the freedom to challenge power is not just an opportunity, it's a responsibility. For the past several years Chomsky has been writing essays for The New York Times Syndicate to do just that: challenge power and expose the global consequences of U.S. policy and military actions worldwide. 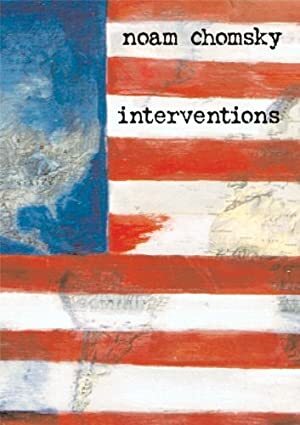 Interventions is a collection of these essays, revised and updated with notes by the author. While Chomsky's New York Times Syndicate writings are widely published around the world, they have rarely been printed in major U.S. media; none have been published in the New York Times. Concise and fiercely argued, Interventions covers the invasion and occupation of Iraq, the Bush presidency, Israel and Palestine, national security, the escalating threat of nuclear warfare, and more. A powerful and accessible new book from one of America's foremost political intellectuals and dissidents. Noam Chomsky has taught linguistics and philosophy at MIT for more than fifty years. He is a critically-acclaimed author of numerous books, including Hegemony or Survival, Imperial Ambitions, Failed States, Manufacturing Consent, and Media Control and Failed States. Track It. This book has been $10.03 within the past year. Log In to track Noam Chomsky on eReaderIQ. to be notified each time the price drops on any book by Noam Chomsky. to stop tracking Noam Chomsky. We started tracking this book on November 4, 2011. The price of this book has changed 72 times in the past 2,723 days. The current price of this book is $10.97 last checked 12 hours ago. This lowest price this book has been offered at in the past year is $10.03. The lowest price to date was $8.34 last reached on March 30, 2017. This book has been $8.34 one time since we started tracking it. The highest price to date was $15.99 last reached on July 20, 2018. This book has been $15.99 2 times since we started tracking it. We last verified the price of this book about 12 hours ago. At that time, the price was $10.97. This price is subject to change. The price displayed on the Amazon.com website at the time of purchase is the price you will pay for this book. Please confirm the price before making any purchases.